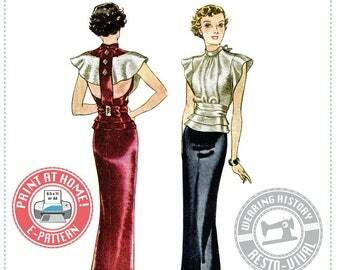 I'm pleased to offer the first Beginner difficulty pattern from Wearing History! This pattern features a cute scalloped apron skirt that is cut on the bias, scalloped shoulder straps that attach with a button at the back, two back straps, and ties! This pattern can be made either in one fabric or in two constrasting fabrics. The apron can either be finished with bias binding or with bias facing. 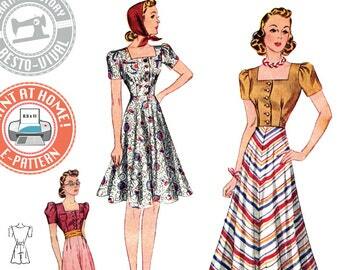 This pattern was based on an original period 1940s pattern but has been extensively updated while still retaining a period fit. included are step-by-step illustrated instructions, cutting layouts for modern 45" fabric widths, and multiple sizes per packet. Sewing both verisons of this apron calls for pre-made purchased bias binding. It is suggested to have a little knowledge on mitering corners of bias binding or facing to make these aprons, as the binding/facing is the most difficult part of construction. As an extra bonus, I am adding bias binding and bias facing photo tutorials to my blog to help with apron construction. You can find the how-to posts here. Small- Bust 32"-34" Waist 26"-28"
Medium- Bust 36"-38" Waist 30"-32"
Large- Bust 40"-42" Waist 34"-36"
XL- Bust 44"-46" Waist 38"-40"
The waist of the pattern is adjustable by the back ties. BORROWING FROM THE 1940's IDEA OF CONSERVING FABRIC, CUTTING CHARTS GIVEN REQUIRE PIECES TO BE CUT BOTH ON GRAIN AND CROSSGRAIN. DIRECTIONAL FABRICS WILL REQUIRE MORE FABRIC THAN GIVEN ON THE YARDAGE CHART AND IS NOT SHOWN IN CUTTING CHARTS. 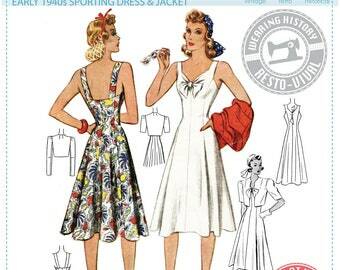 APRON BIB IS CUT ON BIAS AND IS UNSUITABLE FOR DIRECTIONAL PRINTS. This pattern is formatted for USA Letter Size and A4 sized paper. You will need to print this pattern to 100% scale. Open the "READ-ME-FIRST" File for instructions on printing and piecing your pattern. 25 pages for the e-pattern sheet, 8 pages for the instruction sheet, 1 sheet for the "how to use" sheet. This pattern file is formatted to fit on both sizes of paper, and there will be varying thicknesses of white border, which will be cut off, according to pattern instructions. Exactly as described,Download was perfect,thank you so much. 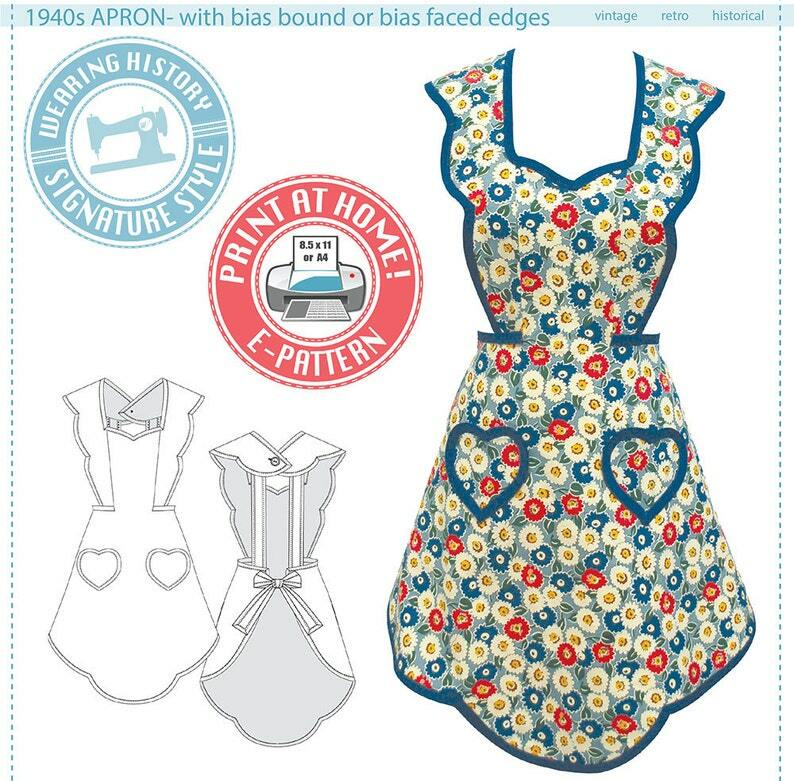 Haven't had time to make the apron yet since I just got the pattern, but the instructions seem very clear and the pattern is complete, so now that I got my printer software working, I'm looking forward to making this apron! Exactly as described! Easy to use pattern.